There is a consensus in accepting the fact that research in all fields of knowledge is an essential activity for social development. Specifically in the sports area, research is remarkably relevant, since it is linked to the socio-economic dynamics of a society and is closely related to the different areas of human activity. Very specifically, football (soccer) has become a spectacular activity around which many economic, social and political interests are at stake. This sport, which has millions of followers, is also practiced by a large segment of the population in many countries. All of this sets football as a determinant cultural characteristic in many countries around the world. The psychological factors of this phenomenon are the core of our research work. This relevance brings up the need to carry out scientific research on this topic and all of its ramifications. This is why the World Association of Universities for the Scientific Study of Football (AMUECFUT) was created. The main challenge is to scientifically research this worldwide sport in order to acquire new knowledge which makes it easier to understand and explain its nature with all its implications. AMUECFUT places itself in the present and the future. It envisions the creation and consolidation of research projects which contribute to the generation and application of scientific knowledge to the most popular sport in the world: football. 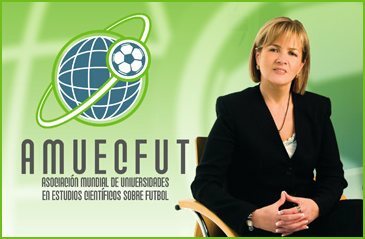 President of the World Association of Universities for the Scientific Study of Football (AMUECFUT).